I disagree. Using the dash isn’t quite as simple as writers believe, so a little instruction—or a refresher course, for those who still retain a smattering of seventh grade English lessons—will do us all a world of good. The en dash (–), so-called because it’s the width of a lower-case N. This dash is frequently used with spaces on either side. However, we will note some exceptions later. The em dash (—), so-called because it’s about the width of an upper-case M. This punctuation mark is typically used flush against adjoining text, without leading or following spaces. Trust me: this just scratches the surface. The variety of dash and hyphen-like symbols in current use is bewildering in its complexity. You may be wondering, “Why does the common dash have two forms?” Good question! As we’ve noted before, book, magazine, and newspaper publishers have squabbled for centuries over who gets to set standards for grammar and punctuation. Governments and professional organizations (such as the American Medical Association) now have also joined the fray. The dash is one of these highly contested questions. Often—but far from universally—book publishers have favored the em dash and newspaper editors the en dash, while academic and magazine publishers took a “pick and choose” approach. Online writers therefore have no absolute authority to guide them. Bear that in mind throughout the rest of this article as I tell you what you should do, and feel free to follow your own preferences instead. 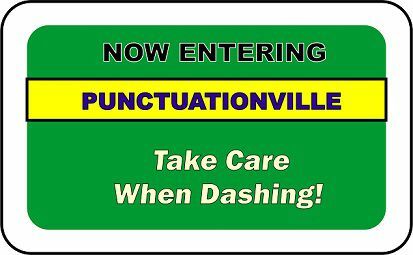 One point I will not concede: the dash cannot be replaced by a hyphen (-) or even a double hyphen (--). The double hyphen was the preferred means of indicating a dash in those ancient days when typewriters ruled the earth. After word processing became the standard for professional writers—around the mid-1990s—the double-hyphen workaround became obsolete. Many of today’s word processors (but not all) can automatically convert a double hyphen into an em dash, or have keystroke combinations to generate dashes. Even if your favored program doesn’t handle this for you, as a writer, you’re still responsible for making sure your work is formatted properly. The comma. “Almost nothing makes us more concerned than when we see our aged parent having a difficult time behind the wheel of a car—because the repercussions could be tremendous if there is a crash.” Dashes provide a little more emphasis than a comma, but either choice separates essential matter from additional explanation or description. The colon. “Let’s face it—men usually aren’t the best at going to the doctor for regular checkups, and Men’s Health Month probably won’t change that.” The dash is a less formal way of telling the reader to pay attention to a conclusion or inference. The ellipsis. “If you’re thinking about skipping the audiologist in favor of purchasing hearing aids online, think again—there’s a reason these professionals do what they do!” The three dots of an ellipsis usually indicate something omitted from a quotation, but they can also informally show a change of focus or thought—and, for this second use, a dash can be swapped in. Parentheses. “It is up to the state bar to make subjective decisions as to whether mental illness or depression—either treated or untreated—is a barrier to a potential attorney’s ability to practice law.” A pair of dashes can substitute for paired parentheses to separate but also highlight information that isn’t grammatically essential to the rest of the sentence. As we have just seen, probably the most common use of the dash is to embed explanatory details within the main sentence. A single dash can set off the information at the end of the sentence—just like this. It’s also completely appropriate to place the intrusive information—which should enrich the topic being discussed—in the middle of a sentence, with dashes on either side. On this point, the em-dash partisans have their bitterest fights with those who favor en dashes. I’ll confess that I’ll usually favor the wider em dash, but that’s a matter of esthetic preference rather than grammar. Whichever style you choose, use it consistently. To indicate suppressed or illegible characters. The faded map said the treasure could be found at Pirates’ C——. Was that “Cove” or “Cave”? Two or more em dashes can also be used to censor profanity or obscenity, or to suppress the name of a criminal suspect. The en dash, specifically, can be used in a handful of situations where the em dash would not fit. To indicate a range of numbers, dates, or times, instead of a hyphen: World War I (1914–1918); Office hours, 8:30 a.m.–5:00 p.m.; Mrs. Herriot often worked as a housekeeper 10–12 hours a day. To indicate scores, votes, or contest results, instead of a hyphen: the Supreme Court’s 5–4 decision; the Tigers win 1–0 in the eleventh inning! To indicate a junction or connection between things or people, instead of a hyphen: the T12–L1 spinal herniation; the Detroit–Atlanta bus route; the Smoot–Hawley Act of 1930. To create a compound adjective when one of the terms is itself a hyphenated compound or a noun of two or more words: Essie was a different woman in her post–New York Fashion Week period; the Virtua Vanity Press is an e-book–only publisher. The dash is a forceful and handy tool for the wordsmith. It’s easy to develop the habit of reaching for a dash instead of spending the time to develop a sentence more thoughtfully. That’s a mistake. Avoid overusing the dash. Dashes naturally interrupt a chain of thought. Dashes are always informal, and sometimes informality doesn’t serve your topic well when you’re writing for your business website. Use too many dashes, and your writing will appear haphazard and fragmented...and you, the author, will seem scatterbrained. The key, as with so many other things in writing—and in life—is judicious moderation. Until next time: write well.